Reinbeck bei Hamburg: Rowohlt, 1989. This is the first German edition of Tony Hillerman's 1978 Listening Woman, the third novel in Hillerman's Navajo Detective series. Hillerman's text is translated from English to German by Friedrich A. Hofschuster. The cover design, by Peter Wippermann, includes a black-and-white photograph of an American Indian in a buffalo headdress, which is anomalous to Navajo culture, as the buffalo headdress is traditionally associated with Plains Indians. 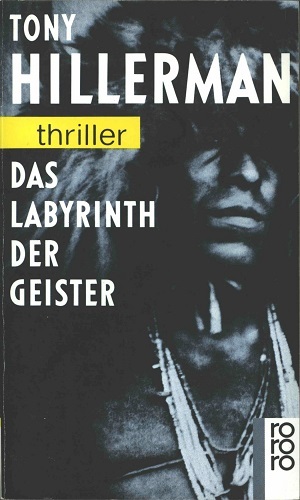 In addition, the literal meaning of the title is "labyrinth of the spirits," and although Hillerman's plot is labyrinthine, changing the focus of the title from the novel's main witness to the underground caves that riddle the submerged edges of Lake Powell alters the novel's cultural, social, and cosmological inflections. [i] publisher's mark, [ii] epigram | brief description, [iii] title page, [iv] publisher's imprint and copyright, [v] list of characters, [vi] blank, 7-102 text, [ ] illustration and advertisement, 103-189,  blank. Binding: Pasteboard with black-and-white photograph. Text in white, with short band of yellow highlighting the word "thriller."